Last night we went to the Moore to mix while eating appetizers and drinking wine before seeing Menomena and the National playing a show to help raise money for co-operative farmers and maybe something about summer flooding. As a former co-op president and fan of the bands this occasion had obvious appeal. Menomena grow on me more and more with each listen and notice of their weird human-made special soundeffects and I'm regularly convinced that the National is among the best working American rock bands we have. I mean, how else could they get away with some of their brilliantly sappy whiskey-logic lines? Also, they are maybe the only band that I can think of that has a rock bassoon onstage. i am so sad i missed this show! 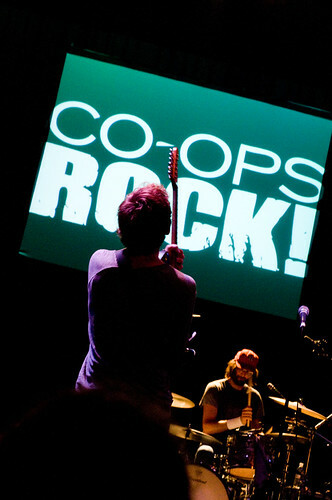 i like co-ops and these 2 bands are total favorites of mine! did menomena play 'evil bee'? oh wait, don't tell me... if you say yes, i might cry!